Sherwood Marketing, owner of the 3 Squares brand, of San Diego, Calif., is recalling about 175,000 3 Squares rice and slow cookers sold in the U.S and Canada. The cooker’s improperly installed wiring can cause electrical shorting in the unit, posing fire and electric shock hazards. 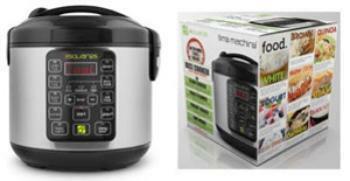 This recall involves 3 Squares-branded Tim3 Machin3 and Mini Tim3 Machin3 rice and slow cookers with fixed power cords. The 20-cup/4-quart or 8-cup/1.7-quart programmable electric cookers are stainless steel with black molded plastic, have a control panel/keypad on the front and measure about 11 inches in diameter and 12 inches tall. The 3Squares logo is printed on the front of the control panel. Model numbers starting with 3RC and ending in 3010S, 3020S, 3434, 5020 and 9010S are included in the recall. The model number is printed on a label on the side of the product. The cookers, manufactured in China, were sold at home, hardware, mass merchandisers and department stores nationwide and online at Amazon, Bed Bath & Beyond, Best Buy, Costco, Get3Squares, Home Depot, Kohl’s, Target, Wayfair and other websites from December 2015, through July 2016, for between $30 and $70, depending on the model and capacity. Consumers may contact 3 Squares at 800-390-0249 from 9 a.m. to 5 p.m. (PT) Monday through Friday or online at www.Get3Squares.com and click on Recall for more information.